Is the Tempur-Pedic brand enough? Tempur-Pedic has been great for the mattress industry. I’m a big fan in many ways. By targeting consumers, the company has grown awareness in the importance of a good mattress and single-handedly raised the average unit selling price for ALL of us in this crazy business. I have a profound respect for its marketing approach. Tempur’s team has built a truly compelling brand. All of this is coming from an innerspring guy, by the way! In addition, I really like Rick Anderson, the company’s president of North America, and have made friends with several people on that team. When you stir in that my sister works for Tempur-Pedic, I really respect the group. Based on feedback I got from several at Market, the plush version bottoms out when you sit on it. The visual appeal is not impressive. Tempur-Pedic is not the only company bringing a message to the consumer this year. The products have lower retail margins. Consider the impact RSAs will have. DO NOT UNDERESTIMATE THE SLEEP GEEK! In the past, when Serta, Sealy, or Simmons introduced a specialty line, all three fell short on the marketing side of the launch. An “S” brand product, at the same price or lower, could sit across the aisle from Tempur-Pedic and Tempur would win the battle. Today, things are changing. Consider that in 2011, Serta had a strong intro with iComfort, told a great story to the consumer, and drove some interest. If you put a Tempur-Pedic priced at $1,499 across the aisle against a Serta iComfort that looks better, and maybe even feels better, who is going to win? It’s easy when you’re re-merchandising a line to build in a price increase, or tweak products to fit the ever-changing market. Tempur-Pedic is attempting to plug a lower-priced product in to an existing assortment, which is much harder. The Tempur team is trying to come down-market, so they needed to make sure the new Simplicity did not look better than the one above it. Here’s Tempur-Pedic’s potential miss: You have to consider what the competition is doing. In the past, that didn’t really matter (as we have all seen), but I think the bedding world has changed. What do you think? Is the Tempur-Pedic brand so strong that it can overcome the challenges I pointed out? Will the company be successful with “bridge” products and will those new offerings allow more people to afford buying the brand promise that is Tempur-Pedic? Stay tuned, only time will tell. I am afraid that Tempur-Pedic is cutting off their own feet. We have sold Tempur since they came onto the retail market and it has been a fantastic product. You’re absolutely right when you say that they have been great for the mattress industry by raising awareness about the need of a great bed and marketing their products but I fear they may be hurting themselves. The best thing about Tempur is that they are a premium product and everyone knows it but I hope they don’t destroy what they’ve worked so hard to build by promoting this less expensive line-up. We’ll definitely be flooring it and our customers will ultimately decide but it will be interesting to see how this changes Tempur-Pedic for the future. I think Tempur may have “shot themselves in the foot.” I believe that part of the appeal of a Tempur is the prestige of ownership. Making a cheap knock off of their own product in order to reach a lower price point will have the same lack luster effect of the other cheap knock offs. The Simplicity series is going to devaluate the Tempur line up. At a time when the knock offs are stepping up and capturing market share (i.e. Serta I-Comfort), Tempur needs to keep the prestige. Like you said customers want “prestige of ownership” with Tempur Pedic. your model cost. All they see is the brand Tempur-Pedic. Very smart on their part. Does Mercedes need to compete with Ford Focus? 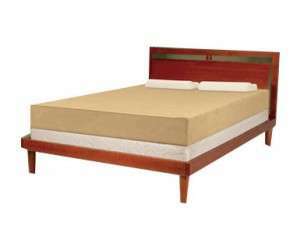 Side by side, iComfort will eat the Tempur Simplicity up.